Statement heels inspired by tribal jewellery and covered in pearly beads make your legs look significantly thinner thanks to thick ankle rings, and who would not want that visual effect? But Kanye is not the only one to thank for these beauties as they were created in collaboration with Giuseppe Zanotti, a brand known for their beautiful heels of highest quality – yet another reason to love them! And as much as I love them, I am by far not the only fan! Anna Della Russo wore these heels to Alexander McQueen show straight after they appeared on the runway, Chanel Iman sported them while attending Givenchy show accompanying their creator the day after and recently Kim Kardashian was seen in them, of course who would not wear your boyfriend’s designs! Kanye West is one of the best singers these days. I really love all hist music and i always watch his concert. His voice is quite great specially live. ‘”`’. 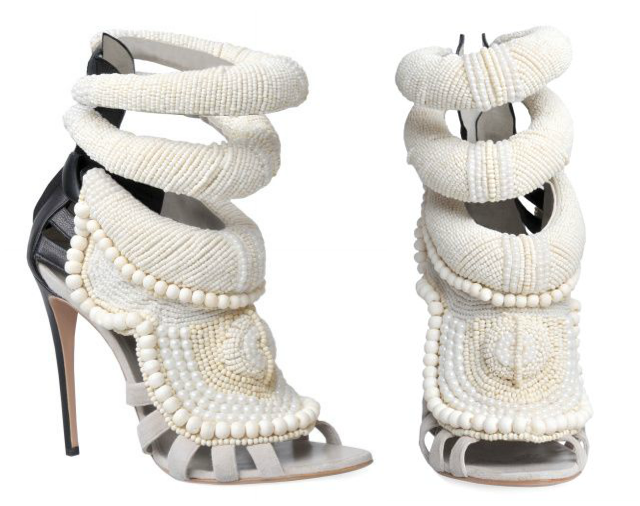 You are currently reading THE Shoes by Kanye West at MY FASHION WISH LIST.